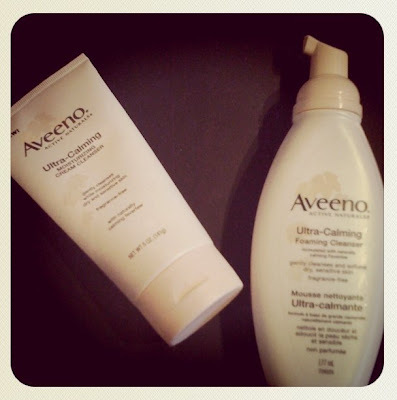 I was very kindly sent the Aveeno Active Naturals Ultra Calming range to trial a couple of weeks ago, and my sister, Michelle, has been trialling them for me. She's been trialling the Foaming Cleanser, Cream Cleanser, and their Daily Moisturizer SPF15. Aveeno recently formulated this range of products with ingredients like soy, feverfew and oatmeal, targeted at calming irritated, sensitive skin. Michelle has pretty sensitive skin, which is why I thought she would be the perfect candidate for trialling this range. She usually pretty red after cleansing, and throughout the day, and she has trouble finding ways to cover up the redness. It's nothing too drastic, and I don't notice it, but Michelle really doesn't like it and is always looking for ways to cover up and conceal that redness. She has been using the foam cleanser in the daytime, and the cream at night. She uses the moisturizer in the mornings. So far things have been looking really good for her! The foaming cleanser does what a foaming cleanser is meant to do, and does a good job, too! Usually, after cleansing, Michelle's skin tends to look really red and rash-like. Recently, I've noticed that her skin doesn't get red anymore after her cleansing routine. This product is really gentle on the skin, and cleans well, but only if you aren't wearing too much product. It cleans off the normal dirt and moisturizer pretty well, but I feel like it doesn't clean makeup and sunblock off too well. I think this is much better used in the mornings, and the foam cleanser at night to remove makeup and dirt properly. I love a good moisturizer with SPF! This isn't too heavy, and sinks nicely into the skin. After using these products for a little over 2 weeks, her redness has subsided. It's gotten so that she doesn't look like she has irritable skin at all. Unfortunately, this did nothing to help curb or stop breakouts. If you are breaking out, you might want to try a different range of products to deal with the acne before using this range. Overall, I think this is a great basic range for those who suffer from redness and sensitive skin - it truly works! I really recommend it for those with sensitive, easily irritable skin. If you have oily, acne-prone skin, it's best to get your acne problem fixed before trying this range, but otherwise, this is an amazing range for the price that it retails at!